1800 Gordon Dr, Naples, FL.| MLS# 219010628 | Bonita Springs, Estero, Naples, Fort Myers Beach FL Real Estate | Marie Pimm PA Realtor. Representing U.S. and International Buyers and Sellers in the purchase and sale of investment or personal property. Marie is a skilled 1031 Exchange Realtor. Less than 2 blocks from the beach and perfectly situated on the south end of Olde Naples sits this Old Florida gem. Hardiplank siding, a Galvalume roof and ideally nestled within a variety of mature landscaping this estate provides a highly sought-after coastal elegance. A charming trellis greets residents and guests through to the grand hallway framed by custom board and bead walls and French glass doors which lead to the courtyard with pool and spa. Encompassing over 6, 000 square feet, this thoughtful design includes a generous kitchen which seamlessly opens to the light and bright family room. A formal dining complete with custom built ins, a gracious master suite inclusive of a separate sitting room with floor to ceiling shelving and 3 separate en-suite guest suites which provide privacy and comfort. 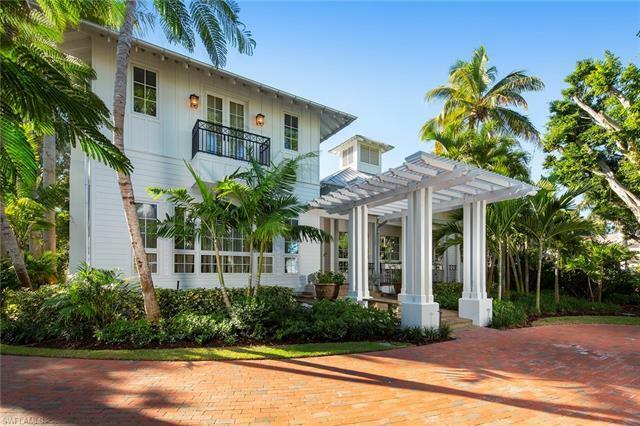 This idyllic Naples retreat sits steps away from the white sandy beaches of the Gulf and only a short stroll to the world-class shopping and dining offered on 5th Ave and 3rd St.